Robbert Flick is a quintessential Los Angeles artist who has continually investigated the city’s conceptual landscape in a career that spans over 40 years. Studying at UCLA under Robert Heinecken in the late 1960s, Flick developed a photographic practice built upon critical thinking and visual deconstruction. In Arena Series, a hard-edged group of photographs from the late 1970s depicting empty parking structures, Flick engaged with subject matter that would continue to motivate his work in the decades to follow. 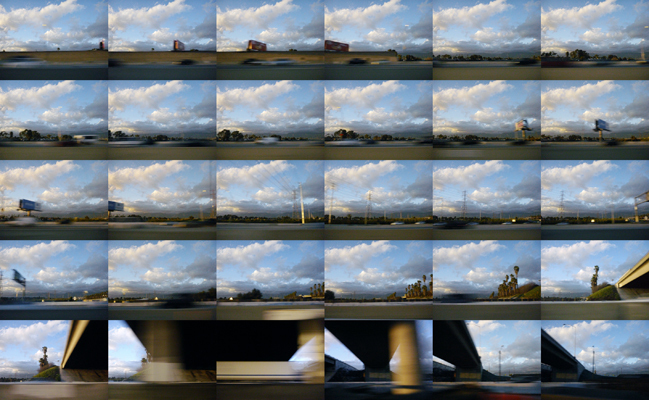 In the early 1980s Flick produced Sequential Views, expansive multi-image grids of LA’s urban environment. These works consist of still frames edited into a formal meta-image that speaks to a spatial and temporal experience as opposed to a discrete ‘decisive moment’. These pieces highlight an important shift from his reliance on the traditional ‘stand alone’ photograph to a dynamic use of multiple images that places the viewer on a trajectory through space and time. Freeways is the latest iteration of the artist’s continued exploration of photographic subjectivity, space/time and seriality. Over the past ten years Robbert Flick has focused intensly on the landscape as seen by car or train during his regular commute between work and home. He arranges the images captured during each journey into signature tracts of color, treating every frame like a brushstroke in a larger work. The resulting large-scale prints are characterized by a visual staccato that emulates the sensation of viewing the Los Angeles landscape as we so often do: through the lens of our car windows. In Flick’s work we experience the layering of our environment and the way we comprehend it, as the observer and the observed move parallel but out of synch. 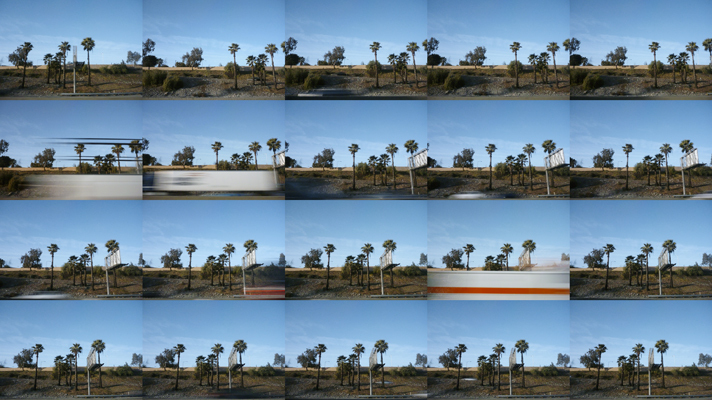 Viewed individually, these photographs are fragments written in a visual language of road and sky punctuated by palms, trucks, and buildings. Taken as a group, the fragments coalesce to form a sharpened observation of the rutted road of an often mindless and mechanized daily commute. 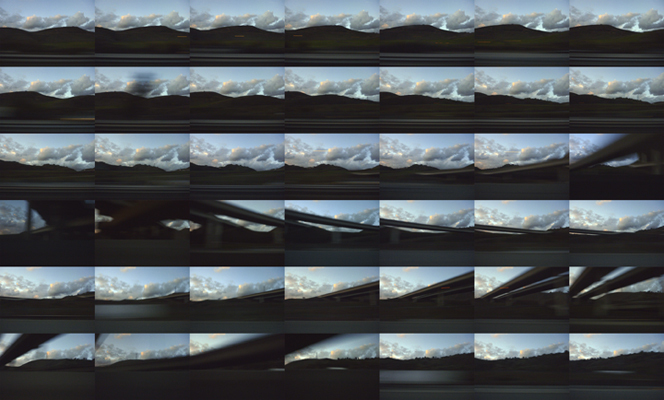 The freeway unfolds across the picture plane like a cut up film strip, presenting each moment both as unique and as an element in a larger scheme. In looking at Freeways we reflect on looking itself. Photography, the practice of an intentional and fixed looking, can fail to convey the way in which the world shifts based on minor variations in position and vantage point. Film alternately takes root in the camera’s ever-evolving and shifting perspective. In pinning down and isolating a specific vantage point while placing it within the context of perspectival deviations, Flick creates work that straddles the divide between the still and moving image.